Drag the picture over the right box to tidy up the play room. Points are added and taken away automatically. Click the boxes to hear the language for each box. Test your French writing skills! 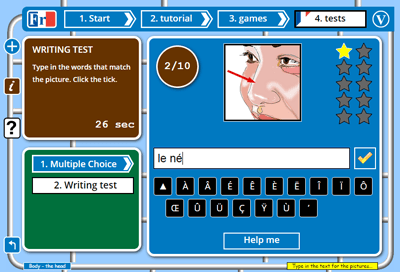 Mix and match is a simple drag and drop matching game for French learners, beginner and intermediate (depending on the topic you choose to play with). The game is set in a play room where the toys need to be put away, and it is up to you to put them in their right places... The picture blocks need to go into the correct boxes to finish tidying the room (and score points, and maybe improve your French a bit... ). There are 5 blocks that need putting away to tidy the play room. Drag (they are heavy..) the blocks to the correct boxes. Click on "PLAY" on the settings page to start the game. You see the first picture block and 3 possible boxes to put it in. Beneath each box is a French word or phrase. Click on a box to hear the spoken audio for that vocabulary (flash only). Click on the picture block and drag it to the box where it belongs. If you are correct, the block will stay in the box, the ball will roll and the teddy bear will do a little jump! If you are wrong, a wrong sound will play and the block will jump back to where it was. Clear all 5 picture blocks to complete the game.